Poetry provides a chance for children to play with words in a way that normal writing, spelling, and grammar do not. Poetry also contains natural rhythm and beat that encourages children to read aloud and share which can help with reading skills and confidence. Studies have shown that poetry activates parts of the brain that other literature does not! There is a multitude of poems in the world so you might feel overwhelmed at first on what to read and where to find good poetry for your family but don’t stress! We can help! Check your local library for children’s poetry. Ask your local librarians for books that they recommend and take time to browse through the poetry section. You might find a poet that speaks to you! Explore these great poetry books for early learners. It is never too early to start reading poems with your children. These books are a smooth start to get your young learners interested. Are you still unsure about poetry? Try various picture books! These are poems with pictures and can help start you into poetry comfortably! Don’t just read the poems; make time fun! Give poetry tea time a try or go all out and try a poetry unit study! 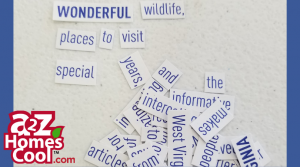 Make a chance poem with words cut out from old magazines, books, or newspapers! Don’t have those things hanging around? Try magnet poetry online! This is our favorite type of poems in my house. They are super easy and fun. 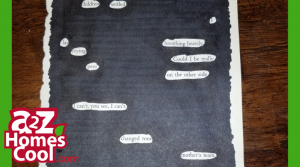 Try redacted poetry! This is great for the child that has trouble finding the right words or gets too distracted when they have too many options. There is something scary and satisfying about marking out the unused words to create something new. Want a harder poetry writing challenge? Try the paint chip poem challenge. This would be great for older students! I did this one on my own. It was a bit difficult coming up with a way to work in colors like amethystina and salty dog, but it was fun, and my children enjoyed listening to the end result. For more poetry activity inspiration try these writing and reading poetry ideas and online poetry sites. Expand Poetry to include Math! At first glance the link between math and poetry might not be obvious; however, they have a connection! Many poets use math to help them develop the look and flow of their work. Here are some of the most common math and poetry connections. Poems and mathematics rely a lot on patterns. In poetry, patterns are found in the different rhyming schemes. We hear a lot of these patterns and don’t even think about them. Read some short rhyming poems and practice patterns by creating limericks. Try your hand on making a classic square poem with equal lines and syllables or be different like the “Square Poem” by Lewis Carroll for a unique challenge. Want something harder? Join math and poetry with a Fibonacci poem! So, why are you waiting? Go break out your tea set, check out some poetry books, and write a few of your own creations! Did you find a poem you love or write something you want to share? Leave me a comment below!